JAKARTA (foresthints.news) - The Deputy Governor of Aceh, Muzakir Manaf, has declared he will provide full backing for any ground level measures required for the enforcement of the moratorium on palm oil and mining expansion in the Leuser Ecosystem. The Deputy Governor, who is also Chairman of the Aceh�s most influential political party - the Aceh Party, outlined his conviction that the decision on the moratorium was a good move towards finding the best field-based solutions for protecting the Leuser Ecosystem in the future. �There is no doubt that the moratorium decision will need to be enforced in the field, not just implemented on paper. I am ready to provide backing to any such ground level efforts,� the Deputy Governor, who is known by the Acehnese title Mualem, told foresthints.news on Sunday (24 Apr) in Jakarta. In addition to focusing on the palm oil and mining expansion moratorium, the Deputy Governor also made the bold statement that safeguarding the welfare of the people living in the area should be a major priority. �The Leuser Ecosystem represents a balance of various interests and perspectives. This balance must be achieved on the ground level. One of the most decisive factors in striking this balance is improving the welfare of people who have been living there for generations,� said Mualem. The Deputy Governor asserted his belief that one of the most important factors in enforcing the moratorium is to maintain consistency at the policy level. He also sounded a warning that the decision on the moratorium would almost certainly encounter various obstacles in the field, meaning that consistency at the policy level in terms of the implementation and enforcement of the moratorium would have to be strong and rooted at the ground level. As such, balanced solutions aimed at protecting the Leuser Ecosystem while improving the welfare of its approximately half a million inhabitants should be sought. "We need to reinforce the moratorium by strengthening monitoring, both by satellite and on the ground. If violations are uncovered on the ground level during the moratorium phase, we will immediately conduct a comprehensive review of the background to these violations, which will then serve as input for finding better field-based solutions for protecting the Leuser Ecosystem in the long term," Mualem explained. 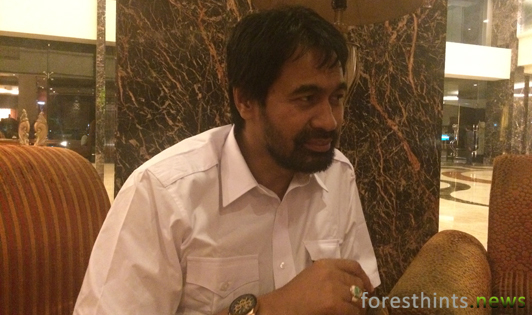 Concluding the interview with foresthints.news, the Deputy Governor said he would be meeting with Minister Siti Nurbaya shortly to express his appreciation for the decision on the moratorium as well as to discuss its ground level implementation. Deputy Governor of Aceh Muzakir Manaf discusses the substance of the moratorium on palm oil and mining expansion in the Leuser Ecosystem with Vanda Mutia Dewi, Executive Director of Greenomics Indonesia. Reacting to her meeting with the Deputy Governor of Aceh, the Executive Director of Greenomics Indonesia, Vanda Mutia Dewi, said that the Deputy Governor�s support was vital, particularly when it comes to implementing the moratorium on the ground level as well as for reinforcing efforts to find field-based solutions to enhancing the welfare of the people who live in the Leuser Ecosystem. �The Deputy Governor of Aceh�s support is very necessary because the moratorium decision needs to translate into ground level action,� Vanda, who has been intensively facilitating the process for the palm oil and mining expansion moratorium in the Leuser Ecosystem on a technical basis, told foresthints.news on Sunday (Apr 24), just after concluding her meeting with the Aceh Deputy Governor.